Water and Flood Level Probes, Water Level probes, and Systems. Working the SMS and GSM technology. The flood leaves behind desperate people, places and destroyed billions damage. The waters have caused great devastation to the south and east and north of the currently gearing up against the destructive power of the flood. At the same time comes during this devastating time by the great dismay of all citizens courage, enterprise, solidarity and helpfulness. All ACS Control System GmbH employees thoughts are with the people affected and wish much strength. It is understood that ACS Control System GmbH provides assistance. Were short in the crisis areas around Deggendorf and Passau level probes with SMS transmission needs to be able to monitor current water levels there. In a few hours of this ACS Control System GmbH was provided quickly and efficiently available. These probes reliably send the current water levels by SMS to the relevant water authorities. Not only Passau, Deggendorf, but also among other Arnstorf was affected. Level probes are here for 3 years at the local creek in use. According to Mr. Lechner from Arnstorf, they work very reliably. The probes are responsible for alerting, when the creek rises at short notice, for example, Crossings and roads block from the building permit. Even in the specific case of floods, the probes have reliable alarm. The water level senor with data memory Hydrolog® 3000 is a battery powered system for autonomous measurement of water levels from 1 up to 100m water column and temperatures in liquids, at environmental temperatures from - 25°C to +70°C. The preferential application fields are water supply and distribution e.g. for measurement tubes, control levels, wells, containers and outstanding waters like lakes and rivers. The excellent characteristics like highest strength against pressure and pressure blows, high resistance against chemicals and corrosion, very good insensitiveness against temperature shocks and EM interference, highest accuracy and long term stability as well as low influence of temperature makes it possible to use the sensor in various fields with liquids like water, waste water, solvents, oil, sludge, grease, cleaning agents, etc., where levels and temperatures combined with date and time should be surveillanced without having any auxiliary power at the place of installation. For applications, where food or drink water suitability is necessary, a corresponding variant can be ordered where only suitable materials are used. The liquid contacts directly the ceramic membrane and causes there a deflection of the membrane because of the hydrostatic pressure of the liquid. At the maximum deflection the membrane contacts a robust ceramic carrier and because of this, the membrane come through over pressure of e.g. 40-times of nominal load at a sensor with a pressure range of 0...1 m water column without damage. The water level proportional hydrostatic pressure signal of the ceramic membrane and also the temperature proportional signal of an optional integrated temperature sensor is measured by the integrated high-resolution digital electronic according to the adjusted measurement rate and is stored loss protected. Because of an intelligent store management the internal data memory with a size of 64kB resp. 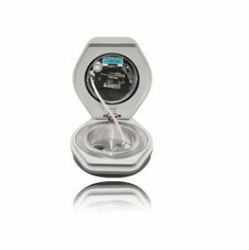 128kB allows a recording of minimum 21 600 up to maximum 216 000 measurement data sets at exclusive storage of the measurement signal water level. If water level as well as temperature are recorded, minimum 16 200 up to maximum 162 000 measurement data sets could be stored. A highly efficient lithium battery that is integrated in the probe ensures the power supply of the device. The battery life time is conceived for minimum 2.000.000 measurements. This equals a run time of minimum 10 years at a measurement rate of 1x per 3 minutes. The module GSM - 3000 is used for remote data transmission (RDT), remote alarming and for configuration of a connected autonomous water level sensor with data memory series Hydrolog® by using the wireless GSM communications network. A GPRS remote data transmission to a FTP server is also possible. It can be used e.g. for the automation of the data transmission resp. for alarming at river water levels that are difficulty obtainable or that must be supervised fast and regular in the case of high water to eliminate or to reduce possible risks. Another case of use can be the realizing of closed-control loops that are installed far away from each other, e.g. to vary automatically the drain of a reservoir due to the water levels of the feeding rivers. A further application case is the realizing of a worldwide stockpiling management, where various stock levels, also from worldwide spread production plants, are continuously transmitted per GPRS to a FTP server. The RDT module is used as connection link between the measuring place with a water level sensor series Hydrolog® and e.g. the data processing equipment in the office resp. the operation forces in the case of alarming. Dependent on the configuration of the RDT module different functions are possible. These are e.g. the transmission of alarming messages per SMS to mobile phones at the attainment of an preset water level or the regular transmission of the measuring values that are stored in the connected water level sensor to the control station or per GPRS to a FTP server. Additionally a standby mode e.g. daily for one hour can be set, where the RDT module and also the connected water level sensor can be configured per remote transmission. The processing of the measuring data's resp. the changing's of the configuration are made by the software Gerätemanager GM - 600 resp. GM - 620. With one battery a run time of much more than 5 years, dependent on the settings can be achieved. There can be sent more than 3000 SMS or more than 400 data record packets of a fully stored water level sensor can be transmitted. Also possible is a standby time, that means call readiness of the RDT module of more than 400 hours. In the case of an unloaded battery a warning message can be sent to prevent timely from a system stop. The battery change can be made fast and uncomplicated at the bottom side of the filler cap. In the RDT module a LCD display for cyclic indication of all relevant measuring place data's is integrated. A control plumbing with a cable light plumbline can be done very easily, because the RDT module is integrated in the cover of the filler cap. Only the water level sensor is mounted in the water level tube. Integrated over voltage protection modules prevents the destruction of the RDT module caused by atmospheric influences like e.g. thunder strike. Looking for Water and Flood Level Sensors, Probes and Gauges ?